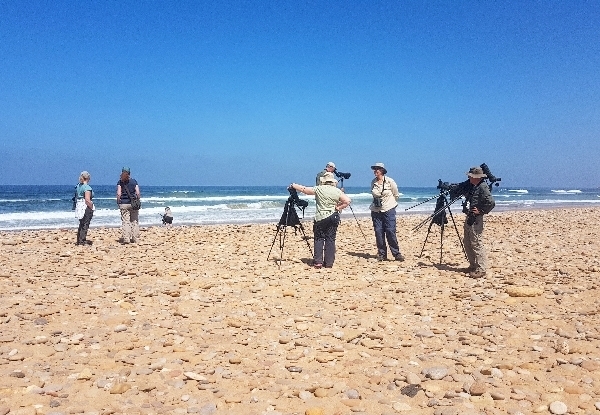 A few shorebirds were missing from our list, so this morning, we made a last-ditch effort to see them at Oued Sous before we drove along the coast to Essaouira. It was a fantastic morning, the light was superb, the river estuary was perfectly still, the river was like a mill pond. One of he first birds we saw was a Mediterranean Gull it sat preening on the near shore with a bunch of Black-headed Gulls, it was a new bird for the list. The morning light illuminated the birds with an orange tinge, the Greater Flamingos, Spoonbills and Avocets looked like a contemporary painting, a photograph could not do the scene justice. Our walk took us along a raised embankment giving us a perfect vantage point from which to view the muddy estuary, with the tide siting at half-mast many birds were feeding on the exposed mud. We saw many Eurasian Curlews, Black-winged Stilts, Common Redshanks, Common Greenshanks, Grey Plovers and our second new bird of the day, a Whimbrel. Further sightings included some really lovely Slender-billed Gulls, Sandwich Terns, an Osprey and lots of other gulls, the number of small wading birds was disappointing and we left with still a few missing from the list. We then drove through Agadir and joined the rush-hour traffic, from the north of the city the road climbed the hillside giving us panoramic views of the port and marinas. The whole coast from then on was rugged with a scrub -covered, sandy landscape and very few buildings. We made two short stops to look at roosting gulls on a couple of sandy beaches when we added Audouin’s Gull to the list before stopping for walk down to the cliff at Cape Rhir. 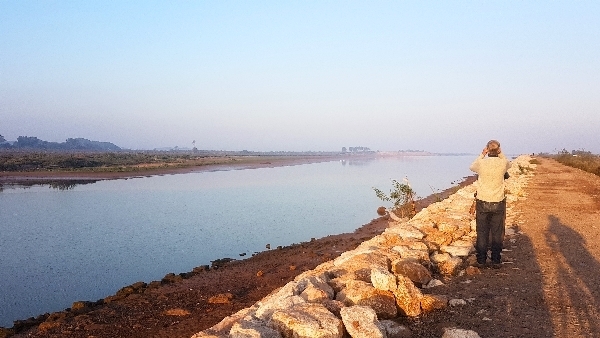 This headland provides an excellent and prominent outlook point for sea-watching. As in previous years the weather was too nice and apart from hundreds of Northern Gannets, Yellow-legged Gulls and dozens of Sandwich Terns very few species were seen. A very light northerly breeze was not conducive to good sea-watching, we needs a good strong westerly, preferably a north or south-westerly. After spending 40 minutes or so we notched two more species, Common Scoter (11) and a single Gull-billed Tern. So we turned our efforts to searching the scrub on the gentle slopes behind us. Soon we found a Stone Curlew, also Black and Black-eared Wheatears, Crested and Thekla Larks, House Bunting and lots of Linnets. 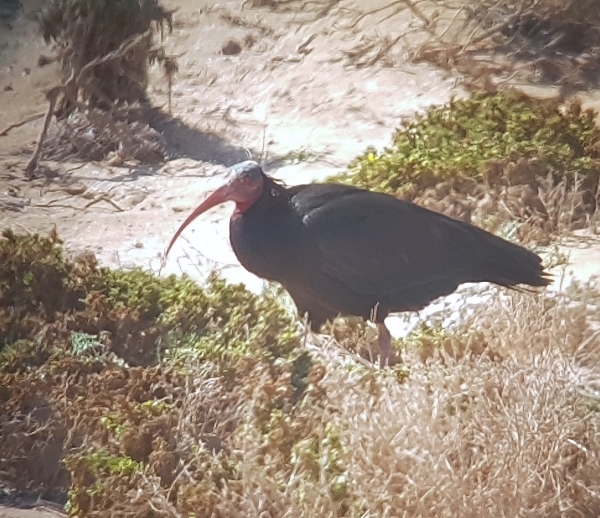 We continued our journey north toward Tamri and just before Tamri Bay we aw a group of BALD IBIS feeding on the scrub-covered slopes. We had great views of these quite ugly beasts before another small flock was found on the seaward side of the road. 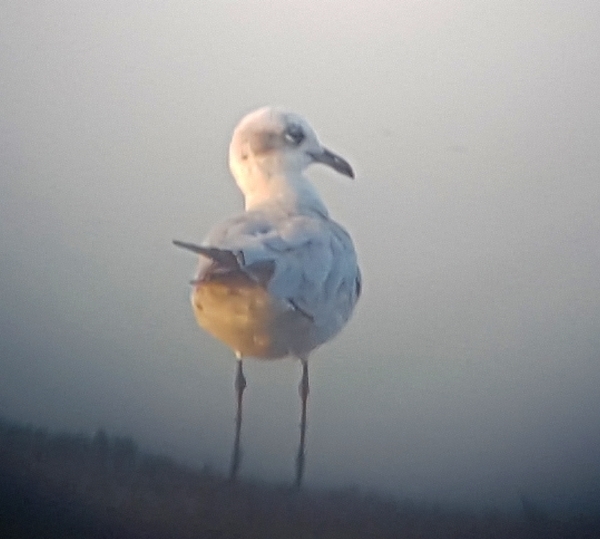 In the large inlet and lagoon at Tamri we scoped another gull roost where the best birds were a few ‘pink’ Slender-billed Gulls, with more Audouin’s Gull and the common bigger gulls. Ruddy Shelduck, Little Ringed Plover and Common Sandpiper were also seen. In the lagoon a few dozen Eurasian Coots were joined by a pair of Little Grebes and two Marbled Ducks. The vast reedbed held a pair of Marsh Harriers and we saw a Sedge Warbler performing its song and display-flight. Just before we left a Barbary Falcon flew low over some of the group and superb views were had, good photographs were also taken. After stopping to buy lunch in Tamri we drove a few more kilometers to an area of Argan Trees where we walked to look for a few more migrant birds. After a kilometer or so we had seen a few birds but not many. Orphean Warbler, Crested and Thekla Larks, Song Thrush, Eurasian Hoopoe, both Great Grey and Woodchat Shrikes and a large flock of Eurasian Linnets about 60 of them! A pair of a Long-legged Buzzards were chasing one another around above the trees and a distant Common Raven made up the rest of our sightings. We continued to Essaouira, stopping for coffee and ice-creams before making our final birding stop of the day. The Oued Ksob runs into the bay just south of Essaouira, we began our walk about 3km up river and walked towards the river mouth. The river was a mere trickle with a few reedy pools, ideal for watching waders, herons and egrets and lots of small passerines coming down to drink. 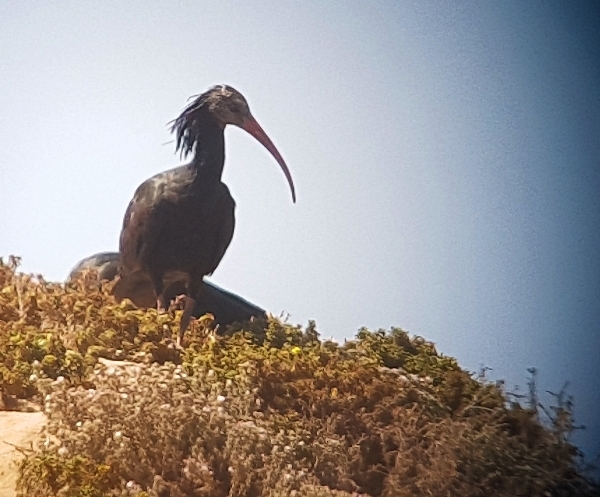 We listed quite a few species, waders included Green and Common Sandpipers, Common Greenshank, Common Redshank, Black-winged Stilt, Greater Ringed and Little Ringed Plovers and both Cattle and Little Egrets and a bunch of Glossy Ibis. 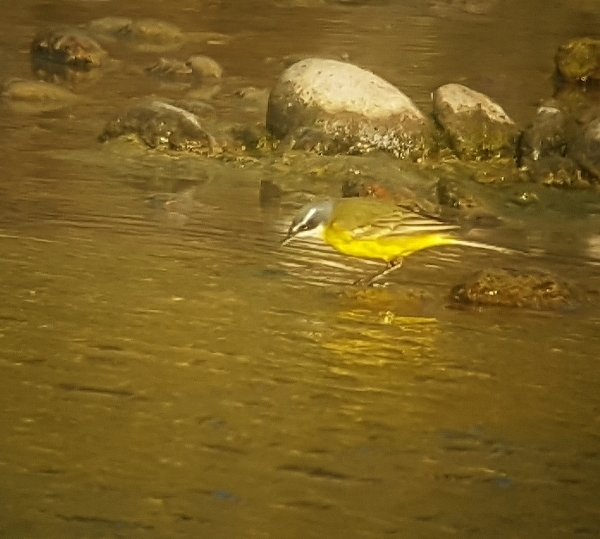 Yellow Wagtails joined White & Moroccan Wagtails and lots of finches were coming down to drink. We didn’t find anything of great interest in the scrub but the Plain (or Brown-throated) Martin was ever present, this little beauty was our star bird of the walk. We concluded our walk at a second bridge where our bus was waiting for us, we then drove to the old walled town of Essaouira. The walk from the car park took us through narrow (traffic free) streets into a ancient world where many shops, Riads, guesthouse and hotels lined the streets. There was a lovely atmosphere, the ambience set the scene for what was about to greet us as we stepped into our wonderful Riad. What a fantastic place, an ancient building steeped in tradition and decorated with all kinds of Moroccan artefacts. We ate a lovely dinner, our last supper together, we then took an early night, it had been another tiring, but bird-filled day.